For a 1am performance, Volcano Playground garnered a fairly impressive turnout of interested and enthusiastic audience members alike. 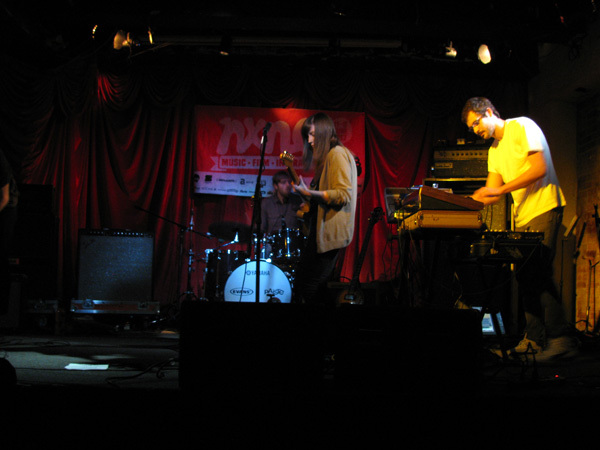 The Toronto-based four-piece band marked their second year at NXNE with a single show at the El Mocambo. Via Bandcamp, Volcano Playground’s studio recordings are dark, moody, and polished sounding – songs that wouldn’t be out of place on a playlist specifically made for solitary night time listenings, through headphones. In performance, Volcano Playground are still dark and moody, but paired with raw live energy and a larger sound that fills the room, their music felt much livelier and energetic. Their shoe-gaze stylings and dreamy male-and-female alternating vocals evoked Slowdive and My Bloody Valentine at times, but make no mistake – their strong set showed promise of a band that has many more ideas up their sleeves. At the end of the night, Volcano Playground were the perfect last band to send you home in a dreamlike haze.